What are the “Values” Represented by Opening the Door to Jihadist Armies? The following op-ed from Germany discusses the recent controversy over a remark by a CDU politician — a member of the same party as Angela Merkel — who said that it would be just fine if Germany had a Muslim chancellor by 2030. So something like this happens to the CDU too; for whom Armin Laschet feels responsible; and how we always stick with what we know. Mecklenburg-Western Pomerania CDU head Vincent Kokert groaned in the Bild newspaper, “No matter how hard I try, I cannot believe that Ralph Brinkhaus said that — I just can’t.” Only the far, far left wing of the Union [CDU-CSU] finds the Brinkhaus remark even acceptable. Genuine glee reigned among members of AfD. Normally it is their lot to experience what has just happened to the Union. That is, that some party representative blurts something out that is of service only to the opposition and does nothing for the home team. So, OK, this fictional Muslim should represent “our values” and then he can be our Christian Democratic chancellor. But what does Brinkhaus mean by “our values”? We have learned that national security has received more than 700 leads to possible war criminals among asylum seekers and not followed up on them — while Chancellor Merkel has unrelentingly shown her happy face and everyone who tends to scent danger is called racist, arsonist or worse. What are the “values” represented by opening the door to jihadist armies? And what about not following up on leads? If only that were all! It appears that influential groups were protective of Anis Amri, whose deportation was consequently repeatedly thwarted, until he had killed a dozen people. There were allegedly bureaucratic hurdles. Yes, yes, the mills of bureaucracy grind slow, don’t they. After the mass murder in Breitscheid Square, the mills ran hot overnight and Amri’s “confidant” Bilel Ben Ammar was able to be gotten out of the country lickety-split. So who is being pals with whom? 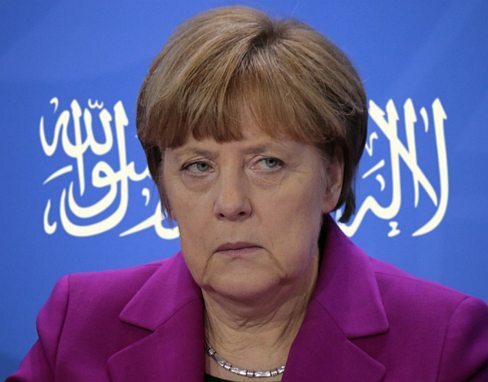 At any rate, the Merkel government — in harmonious splendor with the opposition Green and Left parties, with media, churches, unions, employers, in unity unseen since 2014 — was at great pains to conceal the inpouring danger from us, and to punish any “traitor” who spoke of it. We would like to know what kind of “values” these are supposed to be, hiding behind this large-scale operation. Or maybe better not, since the mere thought of the likely answer can give us goose bumps. Some things just make sense on their own. After the massacre in Paris in November 2015, NRW (North Rhine-Westphalia) governor Armin Laschet of the CDU blustered: “It is irresponsible to connect the murders in Paris to immigration.” Was he right? It is more or less obvious. It depends on to whom Laschet feels he is “responsible.” Security experts connect so many members of the “Arab clans” living and active in his state with the fact that, “for humanitarian reasons,” NRW deports almost no one. “Our values”! The Greens are already well underway with them. So in Schleswig-Holstein, shortly before International Women’s Day, they blocked a ban on burkas in schools and higher education. The reasoning of parliamentary leader Era von Kalben is awesome: There are all too many bans, and we want a free and liberal society. The Greens, who are the party of bans par excellence, suddenly claim to be haunted by fear of being fenced in by “all too many” bans. A Catholic priest in his confessional would clobber anyone for such a bold lie. Kalben immediately doubled down and declared: There are women who wear the hijab “of their own free will,” just as there had been women who were “willingly” walled into the mausoleum with their expired master. That’s their own affair! And meanwhile, if a woman should decide to be “only” a housewife and mother, she must naturally work on her “antiquated” misogynistic idea of her role, because that just won’t do. What kind of times were they, when women hit the streets against restrictive clothing commandments sold to them as “demure”? Fifty years later, the party that leads in feminism steps into the ring as a feminine fighter for full cover. Wise people say that total chaos is followed by total order. By that logic, complete emancipation is followed by complete subjugation. Whoever overdoes it ends with the diametric opposite. So the Left is fated to wring its own neck — and not just the Greens. Did you notice? Sarah Wagenknecht has left her own movement, “Arise.” And, in fact, secretly, by the back door. The non-partisan member of the Bundestag (previously SPD), Marco Bülow, who sits on the board of “Arise,” says he learned of it from the newspaper. Nasty. So? “Arise” appeared to instant recognition. “Leftist” politics claims to be for the lower classes. But what does it have to do with “leftist” politics if, by means of mass immigration first the job market and already to some extent the welfare state is ruined? That is exactly what Wagenknecht asked herself. And then her comrades hastened to pluck away the central idea, thread by thread, until nothing was left except something about Hambacher Forst and “Against the Right.” But who is balmy enough to “arise” for this weak tea? Wage pinch-pennies and welfare destroyers sporting a red star are just as believable as the green hijab or burka women’s libbers. Both of them are only good as caricatures of their once-upon-a-time significance. As long as the election results are sufficient, it’s no disaster. But what happens if women who think of themselves as emancipated notice that the Greens are stabbing them in the back? And if workers realize that their supposed standard-bearers are actually pulling the rug out from under their expectations of leading a worthwhile human life? That is, what if both of them see that these supposed “values” are upside down? Well, when people catch on that they have been lured into a trap, their way out has to be cut off, so they don’t scarper. That is, suckers must be prevented from running somewhere else, so that they will stay with the crumbling mess. 1. December 19, 2016, assault by tractor trailer at the Christmas Fair in Berlin. 2. Hambacher Forst Ancient forest being clear-cut for a new coal mine — protestors camping on scene, and being removed as work progresses. 3. Serdar Somuncu — ethnic Turkish actor and director, known for, among other things, the TV crime series Tatort. This entry was posted in Civil Liberties, Counterjihad, Crazy Socialism, Culture Wars, Domestic terrorism, Enrichment, Europe, Immigration, Insanity, News, PC/MC, Politics, Stupidity, Treason by Baron Bodissey. Bookmark the permalink. Facts not values rule. Values belong to yesterday. I disagree. Facts belong to the realm of science and are indispensable there. OTOH, facts cannot discern the Good or the Beautiful. Those who would shut down discussion on, say, climate change, have confused those two realms. Real science is never settled. Our values guide us in how we choose to act on the facts. Good values lead to good choice of action. ‘It’s been our misfortune to have the wrong religion,” Hitler complained to his pet architect Albert Speer. “Why did it have to be Christianity, with its meekness and flabbiness?” Islam was a Männerreligion—a “religion of men”—and hygienic too. The “soldiers of Islam” received a warrior’s heaven, “a real earthly paradise” with “houris” and “wine flowing.” This, Hitler argued, was much more suited to the “Germanic temperament” than the “Jewish filth and priestly twaddle” of Christianity. Experiments in social psychology have suggested that a small, committed, vocal group can sway a majority. The exact proportion probably varies, but certainly 25% is enough by any standards. Admitting immigrants automatically forms a cohesive identity group, as the immigrants share a common culture in an alien (to them) environment, and stand to gain, politically and economically, by acting in concert in a political situation. The influence of the smaller group becomes even more pronounced as their motivation increases: people bound by a strong religious belief and submissive to their religious leaders can achieve a great deal of political pressure. Even the most homogeneous populations today seem almost evenly split politically: say, Trump supporters versus college-educated suburbanites. Jews, and almost all non-married or non-white women. Any politician alienating a strong, special interest group is not going to remain in office, or will not be nominated to run. In other words, it’s not surprising at all that the democratically-controlled security agencies drag their feet on deporting or arresting dangerous Muslims. Muslims are adept at political organizing and at infiltrating political organizations. The Center for Security Policy showed this years ago in a series of videos detailing the Muslim Brotherhood infiltration of the Bush administration. With those deep wrinkles running down from the corners of her mouth Merkel looks like a ventriloquist dummy, with the emphasis on the dummy.